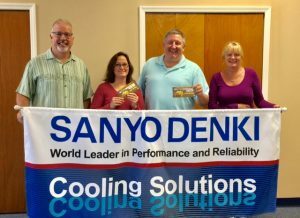 In an effort to encourage the design of their products, Sanyo Denki America, Inc Cooling Systems Division offers a Design Registration Program. The program is closely monitored through their representatives and Sanyo Denki Regional Sales Managers to insure accuracy and integrity. In addition to price protection, Sanyo Denki offers monetary incentives and doubles that incentive for all assemblies. Laura Miceli (Sager) and Terry England (Sager) worked closely with Bob Stenhouse (PMI) to book and ship not only one assembly, but two significant ramp up orders for a local customer. They worked very hard on this tumultuous opportunity and we appreciate all their hard work and relentless efforts. Sager recently held their quarterly meeting and presented Laura and Terry with their incentive, as well as recognized them for their resounding tenacity to capture this business.